ALICANTE, Spain – It’s called Xkuty and with only 45 kilo is an extra light electric scooter designed in Spain. As a cross-over between an e-bike and a regular e-scooter its design presents a look into the future trend on electro mobility on two wheels. 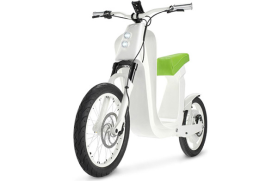 Weighing at a mere 45 kg it’s tempting to categorize the Xkuty as an electric bicycle. However, it doesn’t have any pedals. The Xkuty is a remarkably lightweight scooter equipped with a 1500-W motor for a top speed of 45 km/h. This is powered by dual lithium batteries with a combined storage of 17-Ah, apparently good for a range of 50 km.